When anyone hits the jackpot there is a sense there has been some outrageous luck involved. But not for Newport County, not here on one of the club’s most famous nights as they earned an English FA Cup fifth round home tie against Manchester City in emphatic style. If Pep Guardiola was not watching then maybe that was advisable. In some respects this was a textbook giant-killing (not that Middlesbrough warranted such status). The sodden pitch, the teeming rain, the rugby field. But, be sure, this was the very least 14th in League Two deserved against fifth in the Championship. Reputations flip-flopped, as Newport went further than the fourth round for the first time since 1949. Since them, County’s history has been tumultuous, going out of business in the 1980s, before reforming and dragging their way back up from the ninth tier – a climb they are still battling to continue. They came into last night’s match having once in their last 10 games but, on this form, and with the Manchester United loanee Regan Poole and Robbie Willmott – who was stacking shelves in Tesco just three summers ago – making a mockery of their standing in the pyramid nothing seems beyond them. Leicester City were made to look like plonkers at Rodney Parade in the third round, and certainly Tony Pulis will testify to the uncompromising nature of the challenge City face. Born in Newport, raised in Newport, played in Newport – just like his jubilant counterpart, Mike Flynn. 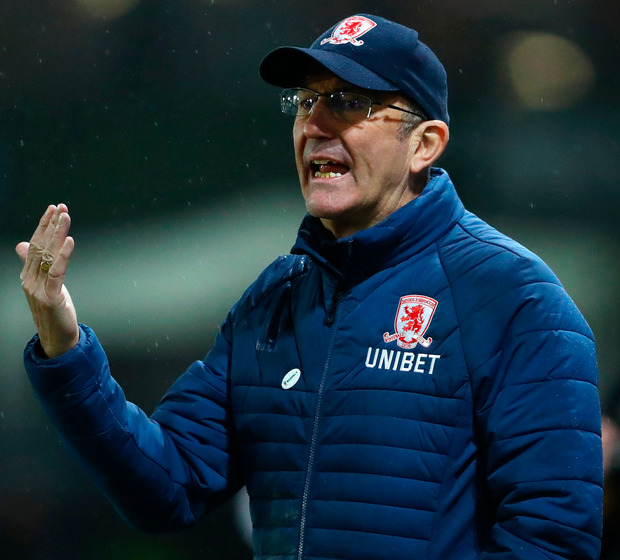 It is fair to presume that Pulis has enjoyed happier homecomings. Without exaggeration, the home side might have had four or five in that first half. Whatever Flynn said at half-time, Newport came out in even more determined fashion and it took Willmott just two minutes to give the majority of the 7,800-crowd the celebration they fully deserved. A flick header from Carlow’s Pádraig Amond, awarded Willmott possession of the left of the area, and from there he curled the ball inside the near post. The icing – appropriately classy – came on 67 minutes when Amond clinically and rather spectacularly volleyed in a Willmott corner. Middlesbrough were bogged down in their own mediocrity as well as the turf, unable to muster even the whiff a fightback.